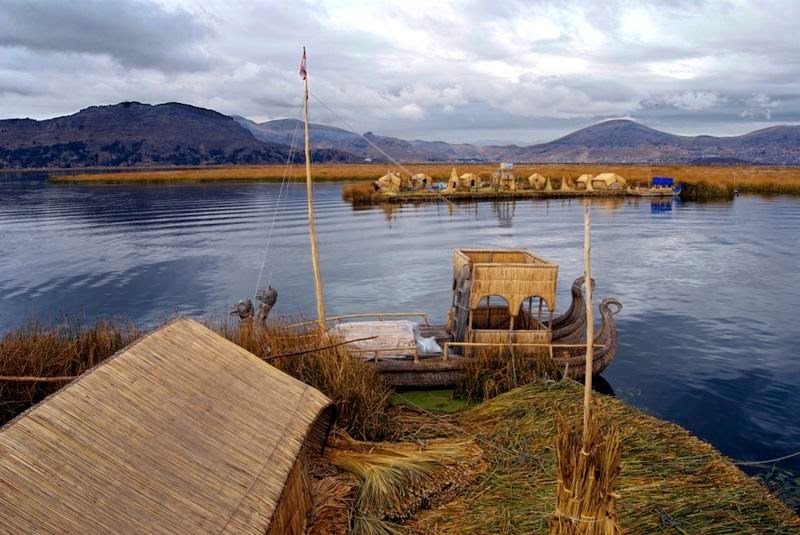 Uros Floating Islands on the lake of Titicaca, Peru — One of the earliest pre-Inca cultures of Peru. 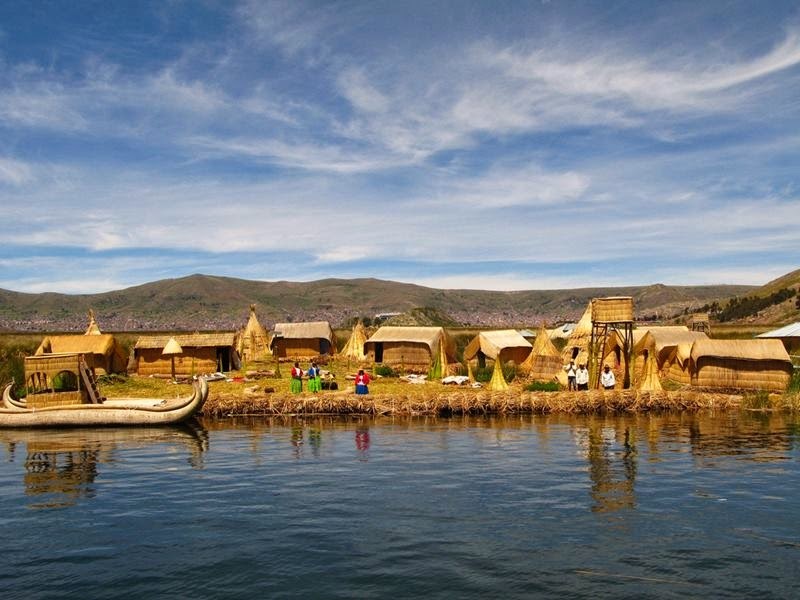 The Uros Island is one of the most famous islands of Lake Titicaca , is located 6 km from the port of Puno and located at a height of about 3,800 meters, is an amazing archipelago of 40 islands of totora, inhabited by the Uros, direct from one of the oldest cultures of the continent descendants. The origin of the town Uro was lost in the labyrinths of history, but presumably descended from Pukinas , one of the oldest communities in South America. 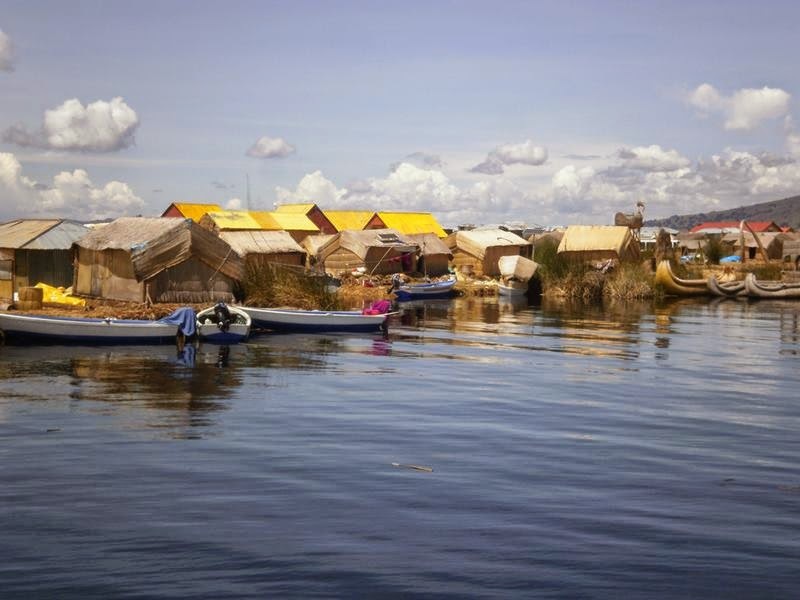 The men of this floating community claim to be the owners of the waters of Lake Titicaca. 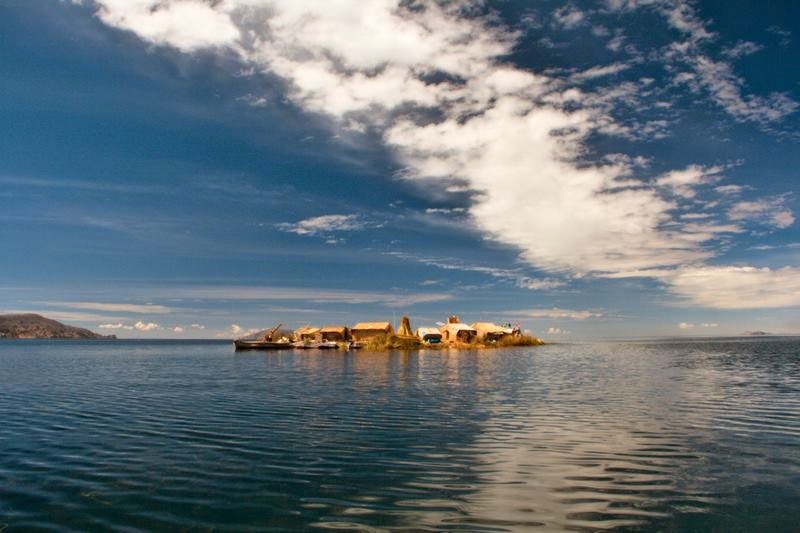 The lake Titicaca is one of the most enigmatic and popular. Natural border between Bolivia and Peru, but, nevertheless, does not freeze due to salinity level, Good size and height. Its deep blue color of because of its depth, reaches 280 meters in some places and its landscape surrounded by mountains make it a wonder of nature. 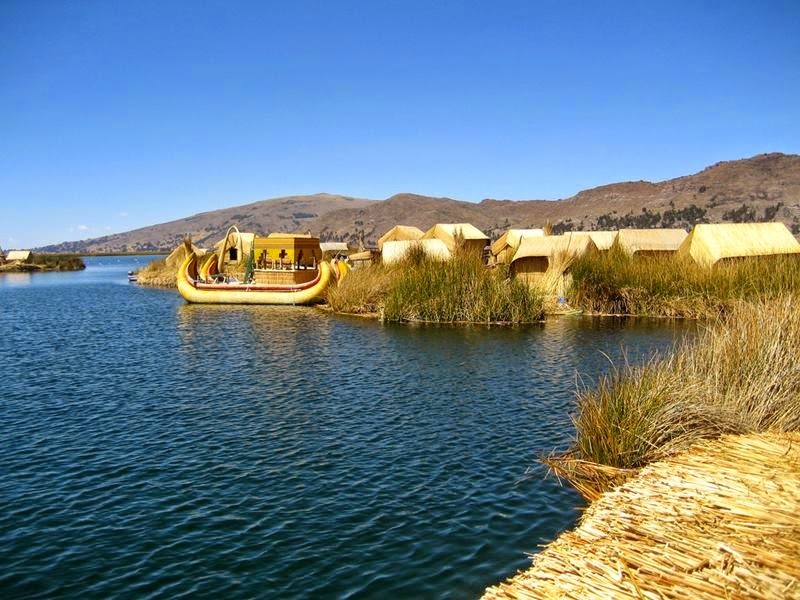 The totora reed is plentiful along the edges of lake Titicaca. The Uru people use them to make their homes, their furniture, their boats, and the islands they live on. Its dense roots support the top layer, which rots and must be replaced regularly by stacking more reeds on top of the layer beneath. The islands are about 4-8 feet thick, they change in size, and more are created as the need arises. Each step on the island sinks about 2-4 inches. It feels soft and spongy when you walk, almost like you’re walking on a waterbed. The home of fierce and brutal people; were subdued by the Incas who considered them as a subhuman people. 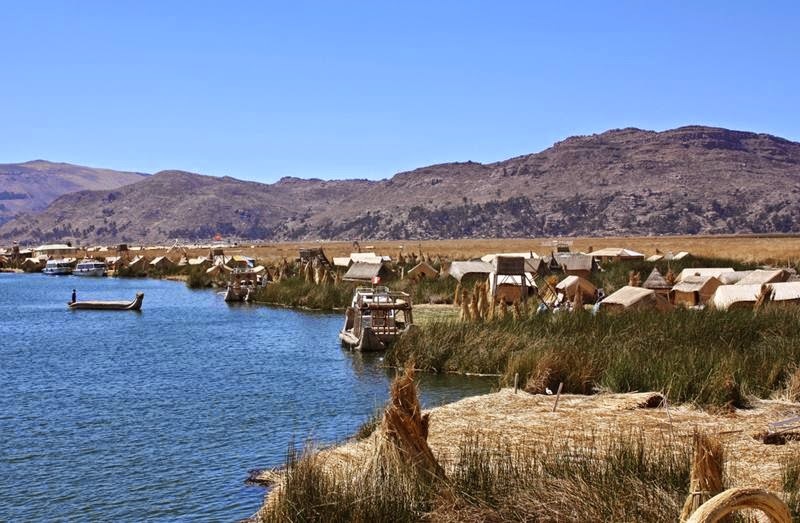 These people lived in perfect harmony with the Titicaca and lived exclusively on artificial islands they wove on the shallows of the lake. As a pure breed is extinct since the mid-twentieth century, their descendants are today miscegenation uro Aymara speak Aymara, and retain many of their ancient customs. 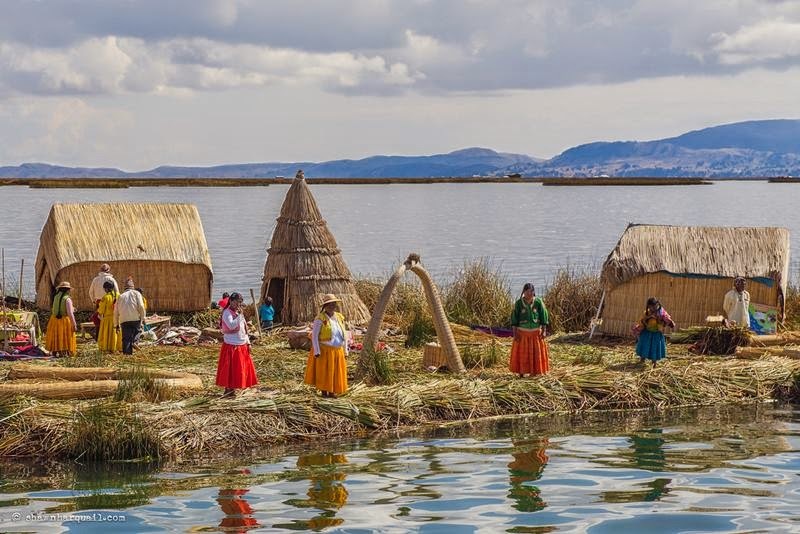 The Uros call themselves the Kotsuña "The town lake." where coexist in a social political organization away from traditional forms of modern civilization. 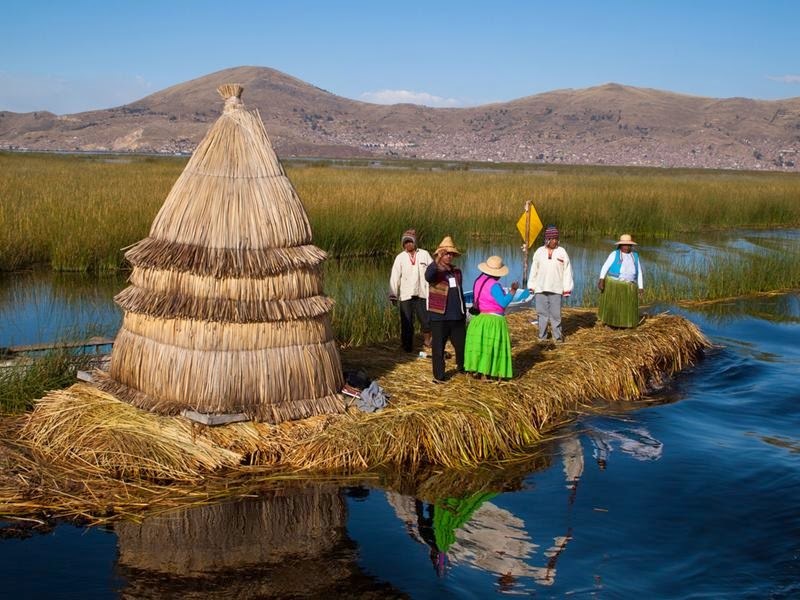 The Uros live on woven reed islands to form a floating layer called Khili , and attached to the bottom of the lake. Normally each island belongs to a family clan and is inhabited between 3-10 families. Then the natives built their house, hut also woven reeds, impervious to rain ceilings, but inside there is high humidity so often suffering from rheumatism at a young age. Food is cooked with fires placed on piles of stones. To relieve themselves, tiny outhouse islands are near the main islands. The ground root absorbs the waste. 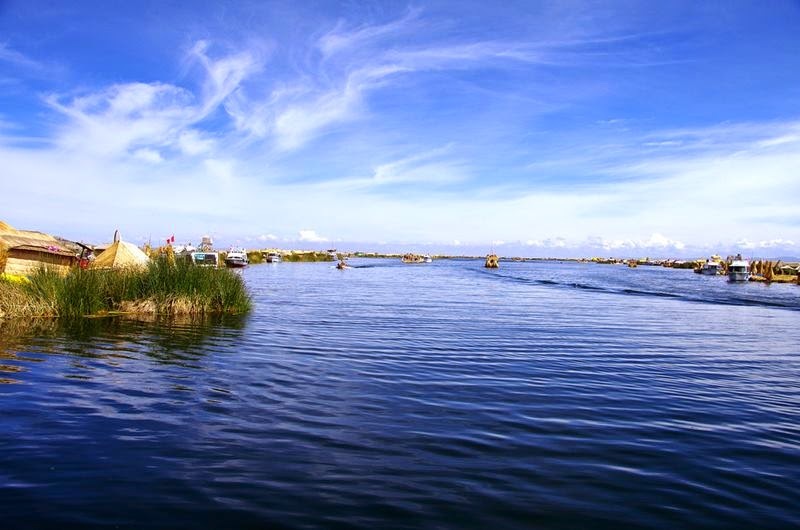 There are 80 floating islands which make up the district of Los Uros in Puno. Some of them have restaurants, churches and primary schools, all of a remarkable instability, very rustic and basic aspects. 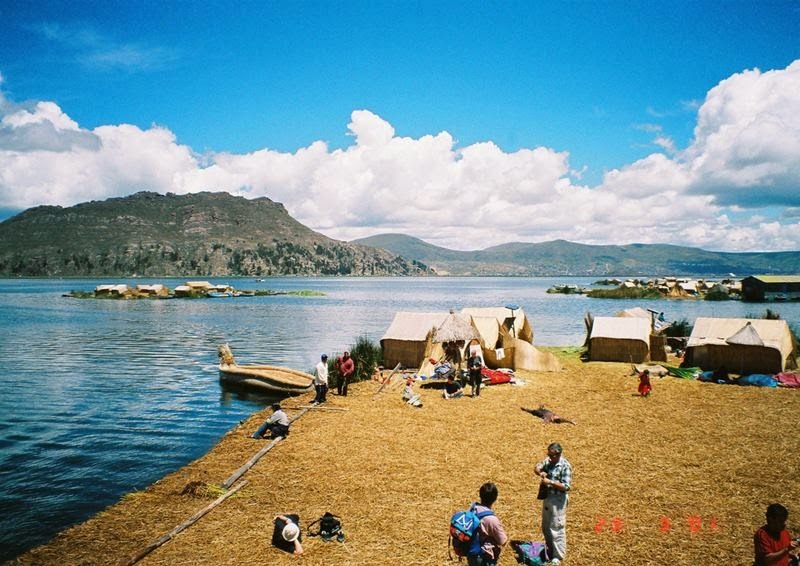 Residents move from one island to another using small and colorful boats (canoes), also built based on the cattail, raw material which serves to build their homes, by way of huts that can be triangular or square with roof gable, the people of Los Uros talk about these útlimas as "modern" houses. 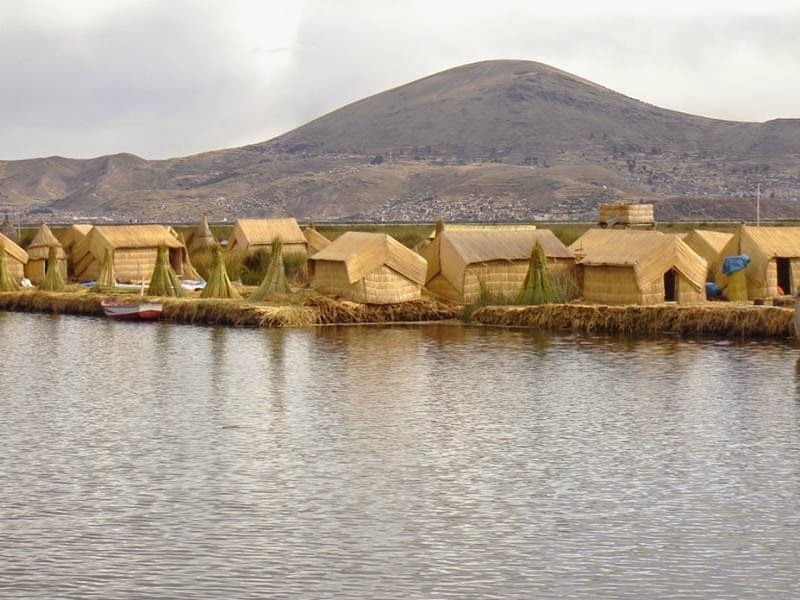 The main activities of the population in Los Uros are fishing, net making and crafts. Beautiful cloaks women spin alpaca wool that after months of manual labor, offer tourists who visit its islands or take Puno to sell. Extreme poverty is one of the main features in the valley of Los Uros, although the friendly people there do not seem very anxious about it. Surprised to see groups of girls, dressed in colorful clothing, barefoot up and down the canoes singing for tourists, melodies songs in different languages. Around 2,000 descendants of the Uros were counted in the 1997 census. Only a few hundred still live on the islands - most have moved to the mainland.